The first wave of crypto-focused smartphones from big players like Samsung is a small step toward a decentralized web. The crypto world is full of buzzwords, but if you can peel away the marketing fluff, you sometimes find innovation beneath the surface. You are often also reminded just how early it is in the history of this technology. Case in point: the blockchain phone. All of a sudden, several crypto-focused handsets are hitting the market, or will soon. The biggest player in the new game is Samsung, which confirmed this month that the Galaxy S10 will include a secure storage system for cryptocurrency private keys. It joins HTC, which for months has been touting the Exodus 1; Sirin Labs, which used proceeds from a huge ICO to build the Finney; and Electroneum, which this week began selling an $80 Android phone that can mine cryptocurrency. So what is the point? In the wildest dreams of enthusiasts, these devices will be a gateway to something called the decentralized web, or “Web 3.0.” In this future version of the internet, blockchains and similar technologies would support decentralized applications—“dapps”—that look and feel like the mobile apps we use today but run on public, peer-to-peer networks instead of the private servers of big tech companies. It’s widely thought that a major impediment to mainstream adoption of cryptocurrency and dapps is that these technologies are too difficult to use for people who are not especially tech savvy. Better user experiences, starting with cryptographic key management, could change that. But getting there is not straightforward, given that key security is paramount: you lose your keys, you lose your assets. This also explains why Ethereum creator Vitalik Buterin seems so excited about one particular feature of HTC’s Exodus 1, called social key recovery. Essentially, users can choose a small group of contacts and give them parts of their keys. If they lose their keys, they can recover them piece by piece from their contacts. Buterin, as usual, is looking far down the road, in this case to a future where people use blockchains to maintain more control over their digital identities and personal data than is generally possible today. Social key recovery is “arguably an early step toward formalized non-state-backed identity,” he tweeted. First things first, though. To be compelling to users outside the bubble of enthusiasts and speculators, these phones will probably need to do more than just keep your keys safe. This week, Samsung and HTC touted a few things they hope will do the trick. Samsung seemed to reveal partnerships with several blockchain projects, including beauty services dapp Cosmee and Enjin, a blockchain-based gaming platform. HTC announced that it has partnered with browser maker Opera to make it easier for people to use crypto, whether for making micropayments on websites or for using dapps. “We are at the dawn of a new generation of the web, one where new decentralized services will challenge the status quo,” Charles Hamel, Opera’s head of crypto, said in a statement about the company’s tie-up with HTC. For now, the $699 Exodus 1 can only be bought online, but HTC’s “decentralized chief officer” Phil Chen tells CoinDesk that the company is working on getting it into carriers’ stores. Samsung’s Galaxy S10 will reach a much bigger market earlier, but it is more expensive, starting at $900. Sirin Labs is selling the Finney for $999. And Electroneum is taking a different approach, targeting emerging markets with a cheap handset. Should you buy one? If you are curious about crypto and can afford one, it might be a nice way to test the waters. If you are already into crypto, you probably already have a wallet you trust, and this first generation of phones may not offer you much extra. 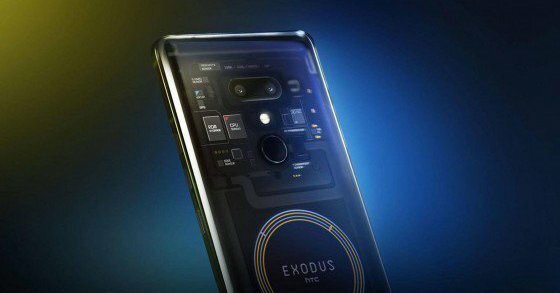 A Wired review of the Exodus 1 called it a “smartphone with a cryptocurrency side gig.” That’s about as much of a “blockchain phone” as can be expected at this point. Indeed, even if these phones take off, the decentralized web will still be mostly a dream. Construction of its foundational infrastructure is in the beginning stages. Perhaps an influx of new users would spawn compelling new applications, which might in turn inspire the development of new infrastructure. But the best the first round of blockchain phones can do is give us a glimpse at a potential future that’s still a long way off.